This movie is one that most people will probably overlook. It’s a shame because it is such a wonderful film. I enjoy getting surprised by a film that has more to offer than you think. I really love the journey of a story that is well told. This movie takes you through an exploration of a journalist and his interns on a hunt for the person who has written this personal ad. “Wanted: Someone to go back in time with me. This is not a joke. You’ll get paid after we get back. Must bring your own weapons. I have only done this once before. 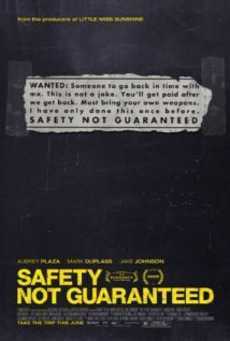 SAFETY NOT GUARANTEED.” The film gets a green light for several reasons the most important is that this film is not what you think it is. Jeff, (Jake M. Johnson) a magazine journalist, is looking for the story surrounding an odd personal ad. He takes with him two interns Darius, (Aubrey Plaza) and Arnau (Karan Soni). They go to Oakview, California to find Kenneth (Mark Duplass), the author of the ad, to see if it was a joke or if this crackpot really thinks he can travel through time. They stake out the post office box and find him and try to insert themselves into his life to get more information. During the investigation Darius is used as a way in, and works to gain his trust. She starts to have feelings for him, and has to confront him on this crazy idea to try and bring him back to reality. The director (Colin Trevorrow) and the writer (Derek Connolly) have worked together on one other project. As a relatively new director Trevorrow has huge potential. He does a wonderful job of taking this story and building likable characters. They build the tension in the story while still keeping it grounded in reality. At no times does this feel like a science fiction film. Even with the time traveler elements in the story the viewer really only sees this as a story about looking into a person’s life to see why they do the things they do. Connolly does an excellent job of keeping this story focused on how people interact and how they are brought together in life. What I love about movies is how they can take us completely by surprise. I knew nothing about this movie when I went to see it. I happened to see a trailer for it and it made me interested in the film as far as I wanted to know more about the person who placed the ad. The creative team has made an outstanding picture out of average people. You feel the real nature of the people we see on screen and in that mindset we experience something completely original. What event in your life do you want to go back and change, and would you?